Over the years Microsoft has had three CEOs, each with a different vision for the company, with each change defining an new era for the company. Under the guidance of Bill Gates, the company saw a steady incline in value. Under Gates’s successor Steve Ballmer, the company stagnated and struggled to reclaim the glory that it had. On February 4, 2014, Ballmer turned the reins of the company over to Satya Nadella. It’ll be interesting to see what impact Nadella will have on the company’s direction. Since Microsoft burst on the scene on April 4, 1975, they have had their work cut out for them. Apple, the top brand then, was destined to become their chief competitor. Over the last couple of decades, Apple has always held a friendly rivalry with Microsoft even through their own changes in CEOs and direction. Apple also had been able to hold Microsoft at bay with a net worth estimated at more than $700 billion – larger than both Microsoft and Google combined. However, Microsoft had enjoyed wide 3rd-party support that has enabled it to stand almost toe-to-toe with the older company and its fiercely loyal customer base. Their rivalry has been the stuff of tech legend; anyone remember those Mac vs. PC commercials? 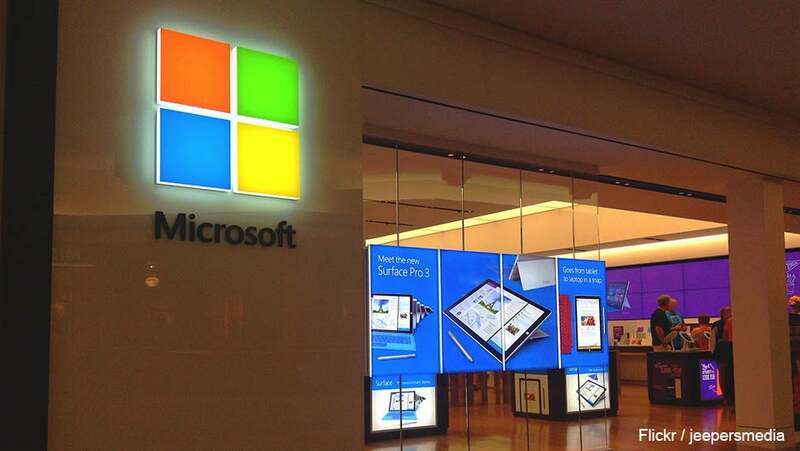 Despite the fact that for the vast majority of their history they’ve been at odds, there have been many times when Microsoft and Apple have entered into partnerships, showing that the two companies have quite a bit of respect for each other. This makes sense, as their most chief rival these days is the tech heavyweight Google, another company that started in a garage and has grown to the number 5 most valuable brand by Forbes. So ubiquitous that it’s almost synonymous with the word “Internet,” Google is a giant in the industry. The go-to search engine for most people, it has even turned around to release the most used browser with 63.7 percent of users. Seriously, Google is literally on its way to owning everything. It follows that the days of “Mac vs. PC” are coming to a close as both companies collaborate more and more to take on Google and Facebook. Is a merger on the way? How has this latest change in leaders affected the company in the last year? This infographic created by the University Of Alabama at Birmingham’s Online MBA Program shows the change in direction that Microsoft has gone in under the guidance of Satya Nadella, Microsoft’s new CEO.